An analysis by MIT economists Pierre Azoulay, Joshua Zivin, and Gustavo Manso supports the idea that funding strategy strongly influences the degree of creativity, exploration, and innovation that can be achieved by scientists. 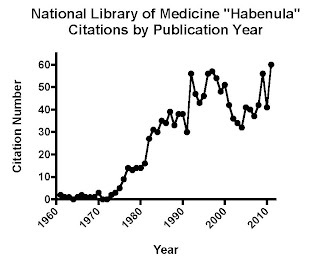 Their study entitled “Incentives and Creativity: Evidence from the Academic Life Sciences”, began by highlighting the example of Mario Capecchi noted above, and compared productivities of researchers supported by NIH funding to those supported by funding from the Howard Hughes Medical Institute (HHMI). HHMI provides substantial flexibility to the Principal Investigators it funds by offering long grant funding periods (5 years for a first award) and by encouraging creativity that may result in initial failures but lead to long-term successes. By contrast, NIH research grant durations tend to be shorter, about 3 years, and creativity is not fostered by the system which now seems less tolerant of out of the box thinking and of the potential for failures than ever before. After controlling for the fact that HHMI researchers tend to be more “accomplished” than the average NIH-supported investigator (by comparing the HHMI sample to early career prizewinning NIH researchers, a matched-by-accomplishment sample), Azoulay and colleagues reported major differences between HHMI and NIH researchers. HHMI researchers had more freedom to experiment, fail, and ultimately innovate. The study concluded that the different incentive schemes offered by HHMI and NIH have dramatic effects on creativity and innovation. Scientists know that this is true. Ideas are hypothesized, tested, and refined, and many of them are discarded. Sometimes along the way, new ideas germinate from serendipitous observations that were not planned at the outset of an experiment that lead to breakthroughs. Perhaps the most famous “accident” of science involved Alexander Fleming, who in 1928 was researching bacterial cultures. 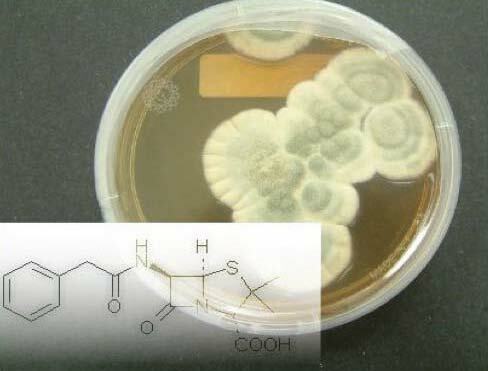 He discovered a mold that was killing his cultures and ruining his experiment—today we know that mold as the antibiotic penicillin, which has saved countless lives. Another Nobel Laureate, Arthur Kornberg, writing on this theme in an article entitled “Of Serendipity and Science” (published in Stanford Medicine Magazine, Summer, 1995), lamented the lack of funding for science: “…today we are suffering from the lack of adequate financial support for basic science, a poverty worsened by severe pressures to engage in "strategic" research…the pursuit of curiosity about the basic facts of nature has proved throughout the history of medical science to be the most practical, the most cost-effective route to successful drugs and devices…Investigations that seemed totally irrelevant to any practical objective have yielded most of the major discoveries of medicine”. So, it seems that offering flexibility, allowing creativity, and supporting seemingly basic and sometimes apparently esoteric research are the most efficient ways to lead to scientific breakthroughs. While it would not likely be possible for NIH to broadly review and fund research like HHMI, the point here is that subjecting NIH to any budget contraction, either by direct budget cuts or by appropriating flat budgets that don’t take into account inflation, will amplify risk-aversion at the NIH reviewer and program levels. This could squeeze out creativity and innovation and result in fewer bricks being added to our collective wall of scientific knowledge, which could undercut our ability to achieve future scientific and medical breakthroughs. This is a very bad idea, not only because our investment in NIH has resulted in tremendously positive public health benefits, but also because NIH-funded research is a major economic engine for the United States (see Part 3 to follow). 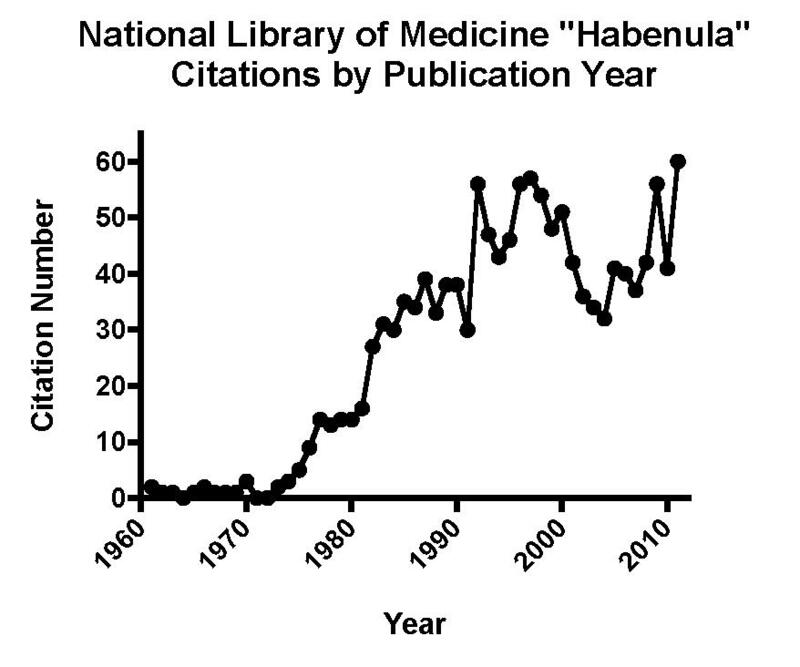 While attending a research symposium at the 2010 American College of Neuropsychopharmacology meeting with a young colleague of mine, he whispered in my ear how moving it was to him that researchers had been, for many years, toiling in relative anonymity studying a part of the brain known as the habenula. The habenula is comprised of two tiny spheres each about the size of a large peppercorn, one on each side of the brain. For many years its role in behavior was not appreciated. However, now it is considered very important to addiction researchers. So much so that the Director of the National Institute on Drug Abuse, Nora Volkow, spent a significant amount of time discussing it this past June in her address to an audience of 500 scientists attending the joint Plenary Session of the College on Problems of Drug Dependence Annual Meeting and the International Narcotics Research Conference. You see, the habenula seems to act as an inhibitory or counterbalancing force to brain areas long known to process rewarding stimuli, the nucleus accumbens and the ventral tegmental area. Thus, the habenula seems to play a key role in influencing addiction-related behaviors. Of course, this is only one of the many roles researchers have attributed to the habenula. It also appears to be involved in regulating sleep and circadian rhythms, responses to pain, stress, and anxiety, and in reward-based decision-making, a kind of learning that enables us to select actions that are most favorable to us. Today’s habenula research likely will lead to new and better treatments for addiction and other brain disorders. However, such research would not have happened had not a broad research foundation been built by many scientists who, over the course of more than 50 years of work, have been quietly yet competently laying key groundwork, much of it funded by the National Institutes of Health, NIH. In fact, most scientific research takes place in the background. Many scientists toil in relative anonymity. They slowly and painstakingly add brick by brick to the scientific foundation of knowledge, often not knowing whether their research will make a difference in public health until many years after it has been published. Like fine wine, scientific research typically needs time to develop and mature, and can only do so if other researchers happen to add additional bricks to the foundation. Ultimately, if a critical mass of data results, that can catalyze development of new treatments. This slow process of knowledge accretion is key to scientific discovery. Alarmingly, the process is in great danger today of being seriously disrupted by the budget challenges we face. With the brief exception of Recovery Act (ARRA) funding period, the NIH budget has been taking hits for a number of years, being maintained at or below the level of inflation since 2004. This year’s NIH budget actually could be reduced for the first time, possibly resulting in the lowest research grant application success rate in NIH’s history. This would result in fewer grants awarded and fewer dollars awarded per grant. As budgets have shrunk, the system as it is now configured has been forced to focus more heavily on apparently “hot” ideas and “leading” researchers. It has become less able to support novel projects and the potential for scientific discovery they offer. This trend is squeezing out many talented and productive scientists who don’t happen to have a hot idea or a stellar reputation, at the moment. Additional NIH budget cuts consequent to the apparent failure of the Joint Select Committee on Deficit Reduction to reach agreement could be catastrophic. Now, at first glance, it seems to make sense to reward hot ideas and people with stellar reputations since those ideas and people tend to provide good returns on investment. However, the problem in science is that it takes many years for the scientific community to identify truly groundbreaking concepts and often, hot ideas and researchers of the moment are just that, flashes in the pan. Unfortunately, with fewer dollars available and increasing numbers of grant applications being submitted by more researchers, the NIH grant review system is becoming overwhelmed. There is an increasing tendency for grant reviewers, who judge scientific merit, and NIH Program staff, who, based on reviewers’ merit scores, determine which projects will be funded, to focus on applicant characteristics like past publications and journal impact factors. Applicants without papers in high profile publications likely will fare worse in trying to get their grants funded than those with publications in higher impact factor journals. In addition, grant review committees are requiring more preliminary data than in past to prove that an idea works; such data is very hard to come by before funding is available. Thus, the barriers to NIH research funding have been elevated. This has been sidelining many good ideas and promising researchers, particularly those working in cutting edge areas, in which few people are well-qualified to review the science. Quite unfortunately, in this funding climate, it seems unlikely that the research we identify today as forming the foundation for our current appreciation of the habenula could be initiated. After all, who would believe without prior evidence that a pair of tiny and seemingly obscure brain structures could play a pivotal role in so many behaviors? Part 2 can be found here and Part 3 can be found here. The National Institutes of Health (NIH) has been a leader in and catalyst of scientific discovery for many years, through its support of a broad spectrum of basic and clinical research across many disease areas. NIH has funded many projects that initially were of interest primarily from a basic science perspective, some that were considered risky, and some that seemed only remotely related to overall public health when first considered. This funding strategy has fostered innovation, reduced disease, increased quality and length of life, and stimulated our economy. 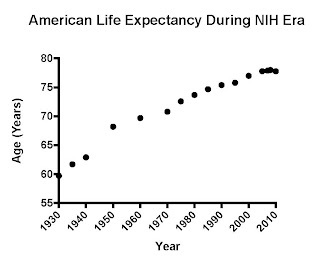 Statistics show that the lifespan of Americans has increased by almost one-third since the NIH was formally established in 1930. Scientific studies show that NIH research is directly responsible for that increase. 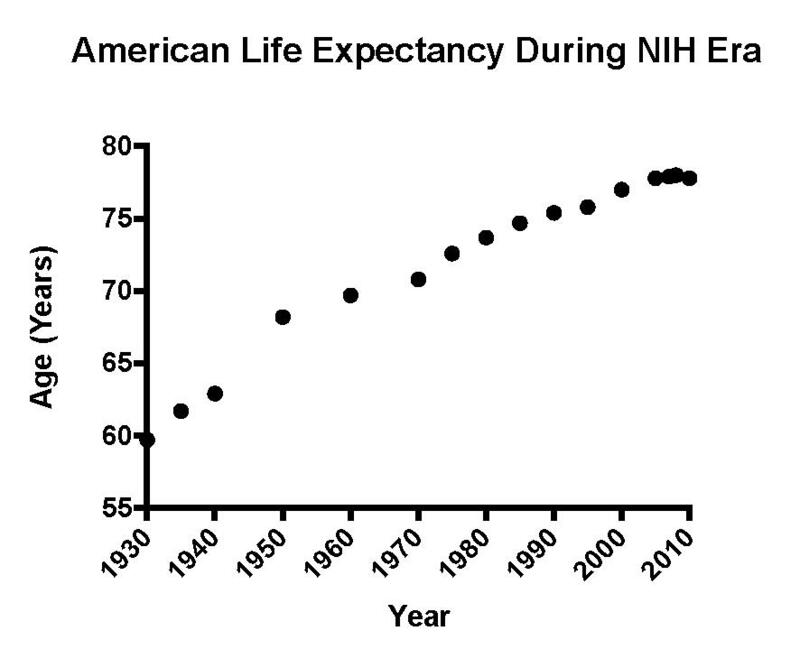 Other studies show that NIH research is an economic engine. Consider the Human Genome Project. This multi-year program was designed to map human genetics and advance research into the genetic underpinnings of human diseases, to develop new treatments for people with genetic disorders. NIH’s $8 billion investment (about 75% of total federal funding for the project) produced an economic impact between 1988 and 2010 of $796 billion, according to a Batelle report entitled “Economic Impact of the Human Genome Project”. Another study entitled “An Economic Engine” sponsored by United for Medical Research reported that in 2008, NIH activities resulted in over $84 billion of wages in the medical innovation sector and in 2010, NIH investment resulted in over $68 billion of new economic activity. By many accounts, American taxpayers’ investment in NIH research more than pays for itself. However, NIH’s ability to catalyze innovation and discovery is in danger today of being seriously disrupted by the budgetary challenges we currently face. With the brief exception of the Recovery Act (ARRA) funding period, the NIH budget has been maintained at or below the level of inflation since 2004, effectively reducing funding. The Senate-proposed appropriation actually reduces the NIH budget for the first time. If that budget is adopted and/or if other NIH budget cuts are instituted, NIH will be forced to award fewer grants and fewer dollars per grant. The result will be that many talented and productive scientists and their ideas will be squeezed out of the system, and possibly lost forever. The evidence suggests that budgetary pressures negatively influence scientific creativity. For example, a study by MIT economists led by Pierre Azoulay entitled “Incentives and Creativity: Evidence from the Academic Life Sciences” compared accomplishments of researchers funded by NIH and by the Howard Hughes Medical Institute (HHMI). HHMI offers its grant recipients greater freedom to explore and longer funding periods than NIH. The Azoulay study showed that HHMI researchers tended to produce more innovative ideas that resulted in higher impact research, even after matching the NIH and HHMI researcher samples on career success. Thus, inducing greater budgetary pressures on NIH is likely to stifle scientific creativity and the public health and economic benefits NIH research offers. One could conceptualize NIH as a large index mutual fund designed to invest broadly so it captures many winners, since when it comes to scientific research, just like when it comes to financial investing, it is very hard if not impossible to predict winners at the outset. None other than billionaire conservative businessman Mr. David Koch has been quoted as using this type of investment strategy to support cancer research (Cancer Research Before Activism, New York Times, March 4, 2011). Mr. Koch, a prostate cancer survivor, explained his reasons for distributing $200 million worth of pledges and donations to several cancer research centers, including a $100 million donation to fund the David H. Koch Institute for Integrative Cancer Research at the Massachusetts Institute of Technology. He noted that he had been supporting cancer research widely based on his prior success picking a Kentucky Derby winner: “I bought a ticket on every horse in the race”. There are many programs American taxpayers support today and many programs are struggling in these lean economic times. Nonetheless, I urge Congress to generously support NIH and to consider increasing NIH funding, which virtually is certain over time to provide a handsome return to American taxpayers both in terms of improved public health and economic stimulus. I also urge CPDD members and other interested persons to lobby your representatives in Congress to support NIH research funding over the coming weeks as budget priorities are discussed. You can do this by identifying your representatives here and sharing the URL of this article. Disclosure: the author is a long-term recipient of NIH funding.